Prague is a huge city with several district articles containing sightseeing, restaurant, nightlife and accommodation listings — have a look at each of them. Prague (Czech: Praha) is the capital city and largest city in the Czech Republic. It is one of the largest cities of Central Europe and has served as the capital of the historic region of Bohemia for centuries. The city is famous for it's unique medieval architecture, the historical centre of Prague is inscribed in the World Heritage List. This magical city of bridges, cathedrals, gold-tipped towers and church domes, has been mirrored in the surface of the swan-filled Vltava River for more than ten centuries. Almost undamaged by WWII, Prague's medieval centre remains a wonderful mixture of cobbled lanes, walled courtyards, cathedrals and countless church spires all in the shadow of her majestic 9th century castle that looks eastward as the sun sets behind her. Prague is also a modern and vibrant city full of energy, music, cultural art, fine dining and special events catering to the independent traveler's thirst for adventure. It is regarded by many as one of Europe's most charming, colorful and beautiful cities, Prague has become the most popular travel destination in Central Europe along with Vienna and Krakow. Millions of tourists visit the city every year. Prague was founded in the later 9th century, and soon became the seat of Bohemian kings, some of whom ruled as emperors of the Holy Roman Empire. The city thrived under the rule of Charles IV, who ordered the building of the New Town in the 14th century - many of the city's most important attractions date back to that age. The city also went under Habsburg rule and became the capital of a province of the Austro-Hungarian Empire. In 1918, after World War I, the city became the capital of Czechoslovakia. After 1989 many foreigners, especially young people, moved to Prague. In 1992, its historic centre was inscribed on the UNESCO World Heritage List. In 1993, Czechoslovakia split into two countries and Prague became capital city of the new Czech Republic. The Vltava River runs through Prague, which is home to about 1.2 million people. The capital may be beautiful, but pollution often hovers over the city due to its location in the Vltava River basin. Prague has a temperate climate with variations throughout the year. Average temperatures in Prague you can find there. In the winter, Prague has definitely its own magic. The snow may cover the surface but it sooner or later melts, so it doesn't usually last too long. However, the weather is pretty unpredictable so it very well may burst into a snow storm but that is not very common. In some years the weather is very mild with no snow at all, so beautiful snowy roofs are not guaranteed. Spring season is one of the best times to come for a visit, especially in the month of May with the flora beginning to bloom after months of hibernation. The summer is a very popular time to travel and you can expect to see an influx of tourism throughout the warmer months. The weather is warm and sunny but sometimes the heat waves can be overwhelming, so people with respiratory problems may have some trouble, this is also the country's rainy season. Colorful and chilly - these two characteristics define the fall/autumn season. Getting dressed warmly is a must because the wind and overcast sky may get in your way. Nevertheless, there are also beautiful sunshine days that practically call you out for a walk. Many Prague residents have a small cottage (which can range from a shack barely large enough for garden utensils to an elaborate, multi-story dwelling) outside the city. There they can escape for some fresh air and country pursuits such as mushroom hunting and gardening. These cottages, called chata (plural form chaty, pronunciation of ch as in Bach), are treasured both as getaways and ongoing projects. Each reflects its owners' character, as most of them were built by unorthodox methods. There were no Home Depots under communism. Chata owners used the typically Czech "it's whom you know" chain of supply to scrounge materials and services. This barter system worked extremely well, and still does today. People had to be careful building these cottages to make them nice, but not too nice that the party officials would take them for themselves. Many were designed to look dilapidated on the outside, but on the inside they are nice and comfortable. Chaty are also sometimes used as primary residences by Czechs who rent out their city-centre apartments for enormous profit to foreigners who can afford to pay inflated rent. Confusingly, several incompatible district systems are used in Prague. Partially, different systems are from different historic periods, but at least three different systems are used today for different purposes. To make things even worse, a single district name can be used in all the systems, but with different meanings. For purposes of this guide, the "old" district system is used. In this "old" system, Prague is divided into ten numbered districts: Praha 1 through to Praha 10. If you encounter a higher district number, a different system is being used. For example, Praha 13 is part of the "old" Praha 5 district. The advantage of the "old" system of ten districts is that it is used on street signs and house numbers throughout the city, so you can always easily determine the "old" system district you are located in. Praha 1 is the oldest part of the city, the original 'Town of Prague', and has by far the densest number of attractions. Praha 2 also contains important historic areas. In this central area, the "old" district system (or any of the newer systems) is too crude to be practical, a finer division is needed. Traditional city "quarters" provide such a division. Their disadvantage is that they are somewhat incompatible with the modern district systems - although "quarters" are smaller than the "old" system districts, a single quarter can belong to two or even more districts. The advantage is that these central quarters are well known and widely used and identical with the homonymous cadastral areas shown on on street and house number signs along the "old" district designation, allowing easy orientation. Buildings in big cities in Czech Republic have two numbers, one blue and one red. The blue ones are the orientation numbers - it is the ordinal number of the building on its street. Historically these numbers always started from the end of the street which is closer to a river. As is normal in Europe, odd numbers belong on one side of the street and even numbers on the other. This allows you to find quickly the house you are looking for. The red numbers are related to the house register of the entire quarter (for example, Staré Město), and thus usually correspond to the order the buildings in that district were constructed. Most people do not remember them; if somebody says e.g. the house is in Dlouha str. number 8, they will usually mean the blue number. Red numbers usually have 3 or more digits. Castle (Hradčany)— The historic nexus of the city, and the highest point on the left bank. Mostly belongs to Praha 1, although a small part belongs to Praha 6. Lesser Town (Malá strana)— The settlement around the castle; location of most governmental authorities, including Czech Parliament. Mostly belongs to Praha 1, although a very small part belongs to Praha 5. Old Town (Staré město)— The nucleus of the right bank, the oldest part of Prague. The whole Old Town belongs to Praha 1. New Town (Nové město)— The district adjacent to Old Town, established in the 14th century. Large parts of the New Town belongs both to Praha 1 and Praha 2. A small part belongs to Praha 8. Jewish Town (Josefov)— A small enclave within Old Town, the old Jewish ghetto. The whole Jewish Town belongs to Praha 1. Vysehrad (Vyšehrad)— The site of the old Vyšehrad castle south of the medieval Prague. The whole Vyšehrad belongs to Praha 2. North - Praha 7, Praha 8 and Praha 9. Praha 7: The large river peninsula just north of the city center. Includes the districts of Letná, Holešovice, Bubny, Bubeneč, Troja as well as a small part of Liben. Praha 8: Karlin is the small strip of land sandwiched between Zizkov and the river and bordering the old town on the west side. Karlin belongs to Prague 8 and prior to 2002, it was a rather unsavory part of the city. After the flood of 2002, Karlin was revitalised and is fast becoming a somewhat conservative, cosmopolitan, professional-class area. On the north-east side, Prague 8 balloons out and encompasses urban areas, business premises and furniture/homeware shopping districts. This is generally not regarded as a tourist area. East - Praha 3, Praha 10, Praha 14 and Praha 15. Žižkov is the name of the district referred to as Prague 3. Previously a working class suburb, Žižkov is home to many expats, short term travelers and university students; and sits on a hill on the right side of the old town. The plentiful array of intriguing and often unusual bars and restaurants, combined with a small but dedicated culture of poets, artists and musicians, gives the area its reputation for being both fun, relaxed and alternative. It is considered one of the more Bohemian districts of Prague. South - Praha 2, Praha 4, Praha 11 and Praha 12. A large part of Praha 2 is divided between historic quarters of New Town and Vysehrad described in individual articles. The remaining part includes most of Vinohrady. 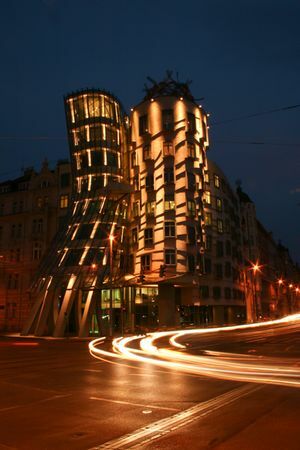 Praha 4 is the biggest and most modern district in Prague. West - Praha 5, Praha 6 and Praha 13. Václav Havel Airport Prague, (IATA: PRG), +420 220 111 111, +420 296 661 111. There are three terminals; Terminal 1 for non-Schengen flights and Terminal 2 for Schengen flights are connected whilst Terminal 3 for private jets is two stops away by bus. Located 20 km (12 mi) northwest of the city centre, it generally takes about 30 min to reach the city centre by car. The airport is served by a number of airlines, Czech Airlines (ČSA) being the national carrier operating the highest number of flights. Check airport website for list of all carriers and destinations. Bus #100 to Zličín - Metro Line B (18 minute ride). Departures every 10-20 minutes from 5:41-23:36, usually less crowded than #119. Bus #119 to Nádraží Veleslavín - Metro Line A (17 minute ride). Departures every 3-10 minutes from 4:23-23:44. This bus is recommended if your destination is anywhere near the center. Bus #191 to Petřiny - Metro Line A (24 minute ride) and metro B Anděl (48 minute ride). Departures every 20-40 minutes from 4:57-23:31. Night Bus #910 going via Arbesovo náměstí (36 minute ride) and I. P. Pavlova (42 minute ride). Departures from the airport every 30 minutes from 23:52-3:56, every 20 minutes on Friday and Saturday night. Airport Express Bus (Bus AE), operated by Czech Railways, departs from Terminal 1 every 10-30 minutes from 05:30 to 21:00. It costs 44 CZK if bought online or 60 CZK if paid to the driver. The bus doesn't make any stops on its way and terminates at the main train station (Hlavní Nádraží). Door-to-door shuttles are operated by various companies with stands in the arrivals hall. The cheapest shuttle is Prague Airport Shuttle (290 CZK per person). Other companies charge 400-500 CZK to the city center. Taxis cost 400-800 CZK to the city center. Fix Taxi and AAA Taxi have exclusive contracts with Prague airport. When you buy your voucher from the taxi stand, you will get a coupon for 20% off of the cost of your trip back to the airport. Door-to-door private transfers are offered by many companies for fixed prices. This service must be booked in advance and the driver will be waiting for you at the airport with a sign with your name. They usually cost 500-800 CZK to the city center. Chosen companies: Transfer-Service.cz, Kiwitaxi.com, Prague Airport Shuttle, Transfer Prague, 24-ATP, T&A Transfers. Rental cars are useful for exploring the Czech Republic beyond the city of Prague. Numerous rental companies have desks at the airport, in the ground floor of Parking C. For a price, the cars will include GPS for navigation. You should not use rental car if you just want to travel around Prague, especially in the city center. The airport has three Terminals. Terminals 1 and 2 are close to each other and host most of the flights, whereas Terminal 3 is somewhat further on the highway and serves mainly private planes. When going back to the airport, remember to look up the terminal number so that you can arrive directly to the correct one. The airport is quite big, modern and spacious. Considerable walking time may be needed between the security control and the exit gate. In terminal 1, gates A have 15 minutes walking time and gates B have 10 minutes walking time. In terminal 2, gates starting with C have 5 minutes walking time and gates D are located directly behind security. Unlike other airports, there is an extra control on the size of your hand-luggage operated by the airport authorities. There is unlimited free Wi-Fi access in whole airport. At arrival, it is possible to exchange currency before leaving the baggage drop area, but you will get much better rates in the city. Another option is regular ATMs at Terminal 1 and 2 which can be found after exiting baggage claims. Turn right after going through doors, walk a few meters, the ATMs will be in the right hand side in Terminal 2 and on the left hand side in Terminal 1. These ATMs will have more favorable rates compared to the Travelex ones in the baggage claim. As of Sep 2017 the ATMs at the T1 arrival area are Money Bank ATMs and charge a whooping 150 CZK (USD 7.50) commission - note that it is charged on top of what your bank would charge you. Prague is very well connected with the rest of the European rail network, and trains run daily between Prague and most major European cities. Trains in the Czech Republic are operated by České dráhy (ČD, Czech Railways), RegioJet, and Leo Express. The high-speed SuperCity train is a great option for exploring the major cities in the Czech Republic. It connects Prague to the eastern city of Ostrava and also Austria and Slovakia in the south. Since 2014 a high-speed RailJet has been deployed on the Prague – Brno – Vienna – Graz route. The Railjet trains travel at line speeds of up to 230 km/h with modern, fully air-conditioned open spaces carriages. The train line from Berlin to Prague passes through the Erzgebirge mountains, and for a couple of hours the passengers are treated to a series of beautiful alpine river valleys, surrounded by rocky escarpments and mountains. Munich: 5¾h, 7 regional expresses a day. Alternatively you can use non-stop bus operated by German Railways (5h, 3 buses a day). Vienna: 4h, ČD Railjet trains roughly every 2 hours. Tickets approximately €19 one way if purchased in advance. RegioJet operates 4 trains a day on this route. Bratislava: 4h, EC train every 2 hours; one night train Metropol; RegioJet operates 3 trains a day on this route. 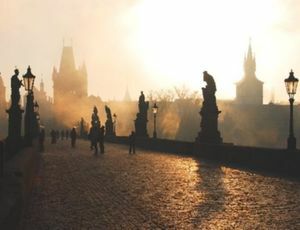 Direct night trains connect Prague also with Zürich, Krakow, Minsk, Moscow and Saint Petersburg. For ticket prices see Czech Republic#By train. All international trains arrive at Praha hlavní nádraží (the central station, abbreviated to Praha hl.n.) which has a connection with Metro Line C. The station has undergone a major refurbishment in 2010. Beware of the taxi drivers operating from the (official-looking) taxi rank alongside Praha hl.n. ; they will attempt to charge a fixed price of CZK1760 (~$80) for a trip within the city center zone, or more than this if you want to travel further. The park in front of the main train station is a haunt for some of the city's undesirable elements and should be avoided after dark. If you do have to come through on foot, it's best to avoid coming through the park and approach from the Southeast along Washingtonova. As you get to the corner of the park there's a police station, so the likelihood of running into problems from this direction is minimalised. Prague has several bus stations. The main bus station for international buses in Prague is Florenc (metro lines B and C). It is located east of the city centre not far from the City Centre. Numerous domestic long-distance buses also depart from here (e.g. for Brno or Karlovy Vary). Na Knížecí station located at Anděl metro station (line B) serves towns in south and southwest Bohemia including Český Krumlov, České Budějovice, Písek or Strakonice. Zličín station located at Zličín metro station (line B) servis towns in west Bohemia including Plzeň, Klatovy, Domažlice, Beroun or Kladno. Černý Most station located at Černý Most metro station (line B) serves towns in north and east Bohemia including Liberec, Hradec Králové, Špindlerův Mlýn or Trutnov. Other, less frequently used bus stations are at Nádraží Holešovice (metro C) and Dejvická (A) where passengers must transfer to the tram or metro. Local suburban buses depart from various metro stations throughout the city. Regiojet , Eurolines , Ecolines , Leo Expres , Polski Bus , Flixbus  and Orange Ways  connect Prague to major European cities. Tickets for international and long-distance buses should be preferably purchased in advance (online or at bus station), tickets for local buses are usually sold at driver. To find out your bus station and schedule go to www.idos.cz. Green Shuttle  offers transfers between Český Krumlov and Prague. Prague has highway connections from all around. Highways, expressways (very similar to highways and having the same speed limit) and first-class roads in the Czech Republic meet European standards and are well marked, with many gas stations alongside. Other roads are usually uneven and poorly marked. When travelling on highways and expressways, you must have a vignette (except for small in-town sections which are extempt and marked so). You can buy ten day, monthly or annual vignettes at gas stations, post offices or border crossings CZ government motorway site. You should fill your license plate number on it and place it on your windscreen from the inside, in the lower right-hand corner. Failure to display the vignette is fined on the spot. The vignette has a second part which you fill in with your license plate number as well and save it for any future police check-up. If your car is over 3.5 tonnes, you need toll unit (“premid”) instead which is required on first-class roads as well (marked with M in a circle). The southeastern highway (D1, E50 and E65) is the Czech Republic's oldest and most used highway but it's undergoing a massive reconstruction so expect delays and diversions. It leads through Brno and Ostrava to Poland. It offers a good connection to Vienna and Bratislava or Budapest and all traffic from the east. It runs for about 300 km (185 mi) and usually takes about two hours to Brno. The southern highway (D3, E55) is not completed up to Prague, part of D1 and then first-class road 3 are used instead; traffic is very heavy on this road, leads through Tábor and České Budějovice to Austria (Linz) There is also a another highway D4 to Příbram and then continues as first-class road 4 to Písek it goes on the other side of Vltava and is in quite a bad shape. The southwestern highway (D5, E50) leads through Plzeň to Germany where it continues as A6. Riding from the state border to Prague takes about an hour and a half (151 km / 94 mi). To the west, there is highway D6 (E48) leading to Karlovy Vary and Cheb. Only about one fourth is completed with heavy traffic in the other sections. The northwestern highway D7 leads to Chomutov and Chemnitz. Near Prague, only very small part is finished. Václav Havel Airport is located near this expressway. To the north, you can take highway D8 (E55) to the German border. Leads through Ústí nad Labem and continues to the northern Germany via A17 (Dresden, Berlin, Leipzig). To the northeast, you can take highway D10 (E65). It leads to Liberec and Turnov. It is not regarded as an important access route as there are no major cities in this direction (Zittau in Germany, some cities in Poland) but it offers a good connection to the Czech mountains Jizerské hory and Krkonoše (Riesengebirge) with the best Czech skiing resorts. To the east, you can take the newly completed D11 (E67) which goes to Hradec Kralove and Poland. About half of the city is encompassed with the ring highway D0 while the other half (northen and eastern) is still waiting to be completed. During work days, prefer to use this road instead of going through the jammed city as many GPS suggests. Lot of Czech highways are unfinished and are under development (D4 and D11 being extended, D3 to České Budějovice and Linz was supposed to be completed in 2020 but has been delayed and no new date has been set) so things will get better. Unless there are road works, there are only seldom traffic jams on Czech highways with the exception of D1 between Prague and Mirošovice (where first-class road 3 splits). Prague suffers from heavy traffic and on week days the main streets are one big traffic jam. It is a really good idea to use the P+R (park and ride) parking places where you can park your car for a very small fee and use public transport (however these are usually full on week days as well). The P+Rs are situated near all highways and are well marked. Note that traffic wardens are rife and parking in most residential streets in and around Prague city centre without a valid permit will result in a parking fine. In particular, avoid blue-marked areas which are residents-only (all time) and cars are regularly towed away. Orange and green-marked areas are designed for 2-hour and 6-hour paid parking but spots are usually hard to find; parking in these areas is mostly unlimited and free on weekends and during night but check the signs. There is a reasonable number of other paid parking options in the centre though, such as Václavské gáráže, Mr. Parkit or Vincipark. Public transportation is very convenient in most of the areas visitors are likely to frequent. One key thing to note if you are staying outside of the the city centre is that public transport buses do not enter the historic districts (Old Town, New Town, Lower Town, etc. ), so as to prevent air and noise pollution. One must transfer to a cleaner and quieter electric-powered tram or a metro before reaching historic areas. Prague is renowned as a very "walkable" city. For those who enjoy seeing the old and new city by foot, one can easily walk from Wenceslas Square to the Old Town Square, or from the Old Town to Charles Bridge and the Castle District. However almost all of the streets are cobbled, rendering it very difficult for disabled or elderly travellers to get around effectively. Drivers must yield to pedestrians at all marked pedestrian cross-walks. Remember that in the Czech Republic, it is illegal to cross at a pedestrian crossing on a red man, and if caught this incurs a fine of 1000CZK. There are three metro (subway) lines, numerous bus and tram (streetcar) lines, regional (S) trains within Prague, as well as a funicular to Petřín hill and few ferries across Vltava river - all integrated in Prague integrated transport (PID) . The tram and bus schedules are posted on the stops, and the metro operates from early in the morning (around 05:00) until approximately midnight. Buses and trams start earlier and finish later to connect to metro. Between 11pm and 1am you can use trams going to the depot, sometimes taking unusual routes. The schedules , maps  and prices  may be consulted at their website. Prague public transport is fast and efficient when you know how to use it. Sometimes you have to change a few times - the schedule website  is the best way to plan your trip. If you get lost, you can take some bus / tram, almost all lines pass through a metro station where you can orient yourself. As you can see, the 24-hour or 3-day tickets are not economical unless you plan to travel more than 4 times a day for 90 minutes (6 hours). It is also useful to know that the PID centralised ticket does not cover for the historic trams (for eg line 41) that are in service to stations like Malostranská. Tickets for these special trams can be bought on-board and cost around 32 czk. Mobile app - Tickets can be conveniently be bought using the PID Lítačka app. The 24 hour day ticket works well for short stays. ticket machines - sell 24, 32, 110 CZK tickets (take coins only but do return change). New machines also accept credit cards (currently installed at the airport, metro stations and at main train station). Prague Public Transit offices - located at some Metro stations (and the airport or main train station), sell all kinds of tickets. The most central one is at Můstek =A= station at the bottom of Wenceslas Sq. bus (but not tram) drivers - sell the 32 CZK tickets for a higher price of 40 CZK - not recommended, as drives may run out of those tickets and often don't speak english. via SMS - service working for all czech operators, you have to send an SMS in format: DPT32, or DPT24 or DPT110 or DPT310 to cell number 90206 and your sms ticket comes in about 2 minutes. Validate your ticket by slipping it into one of the yellow boxes in the tram or bus, as soon as you board. In the metro, validation boxes are located inside the stations before the stairs. The ticket has to be validated correctly - face up, in the direction of the arrow. After having changed the tram/bus, you must not validate it again. Be sure to keep it handy until it expires. See "Correct usage of tickets"
Tickets are not checked upon boarding, but usually uniformed (in metro) or plain-clothed (in a tram or a bus) ticket inspectors often make the rounds asking to see your ticket. An unstamped ticket, or a ticket which has been stamped more than once is invalid - it will be confiscated, and you will incur a 800 CZK fine when paying on the spot, penalty fare desk or by bank transfer within 15 days otherwise supplementary charge raises to 1 500 CZK. Bank account details are provided in a "record of transport inspection" that you will receive. Don't sign the form and don't forget that you are not obliged to pay on the spot in any case! Even though fare dodging seems easy in Prague and it is almost impossible to collect fine abroad, you should invest in the cheap ticket for the simple reason that Prague's transportation works perfectly and it functions on the honor system - help it stay that way. Public transport continues at night and it's fairly extensive . Night trams or night buses (00:00 to 05:00) usually come every 30 minutes (every 20 minutes on Fri/Sat and Sat/Sun nights). Every 15 minutes during this time, trams leave the central exchange stop of Lazarská in the centre of Prague. All night trams go through this stop. You can easily change tram lines here if nowhere else. At all night exchange stops, trams and buses wait for the connecting tram/bus. Do not underestimate how close to the footpath the trams will be when they reach the stop. It's safer to take a few steps back before the tram arrives, as wing mirrors could cause injury for taller people. In Metro, you should stay behind the dashed safety line on the floor about half a meter from the edge of the platform. On an escalator, it is customary to stand on the right side and walk up on the left side. When you use public transport in Prague, keep in mind that it is good etiquette to let elderly people, pregnant women or disabled people sit down. Try to avoid getting taxi on the street (public transportation is always the better option in Prague) and if you have to, try to negotiate the price in advance. If you take taxi on the street, you should know that maximum price designated by city council is 40 CZK boarding fee + 28 CZK per km + 6 CZK per minute of waiting. Nejlevnejší Taxi, +420 226 000 226 . (18 CZK/km) (site available in English, mobile app available) - Part of Taxi Praha with cheapest prices but sometimes low on free cars. Check you have rate No. 4 on the taximeter. Since 2014 mobile taxi apps have become widespread in Prague. The advantage of using a taxi app is that you always get a fair price, all payments are done by card, there's no need to call anyone, and you can get a taxi at any time in less than 10 minutes. Uber, the global taxi giant, officially illegal in the Czech Republic. If you have an account from any other country, you can use it in Prague as well. New clients get a 400 CZK bonus for signing up. App available for Android, iOS and Windows Phone. In rush hours it may be more expensive than maximum price allowed by city hall. Liftago, the local equivalent to Uber which uses official cabs rather than regular cars. Around 30% more expensive than Uber. New clients get a 300 CZK bonus for signing up. App available for Android and iOS. At the most busy and most lucrative locations in the city centre like the Central Train Station (Hlavní nádraží), Venceslas Square, Old Town Square, Pařížská, Karlovy Lázně there is about 90% chance of being ripped off by a taxi driver if you don't speak Czech. These locations are apparently occupied by a small mafia of taxi drivers which don't hesitate to charge you 2-10 times more the actual price! If you have the chance rather walk a little bit more and take a taxi somewhere else, or use public transport. Taxi drivers at the Central Station may show you a printed card that details "flat fares" for travel within the city. This is completely a scam. Don't fall for it. If the cab doesn't have a taxi-meter don't even enter it. Always insist on having the taxi-meter turned on and ask for a printed receipt once you leave the taxi. The receipt should have the driver's name, address and tax identification number included. Even though you ask for a receipt the taxi-meter could be tampered with using the so called "turbo", which will cause the taxi-meter price to go sky high. It's advisable to keep an eye of the total in the meter and make sure that it is visible. If you decide to flag down a taxi on the street make sure you stop a car with the logo of one of the major companies. It's not a bullet proof solution, but at least you have some chance to get some satisfaction from the taxi dispatching company. About two years ago, an information desk was set up on most taxi stands in the city, with orientation prices to most popular destinations from that stand. But there is a flaw in the local law, which actually allows some of the taxi companies renting the taxi stands (specifically around Old Town square) to charge VERY high prices (about 99CZK/Km). There is an ongoing law suit regarding this, however the practice still hasn't stopped. The most infamous company in this regard is a recently created AAA Taxi s.r.o. deliberately creating its name to resemble regulated and popular AAA Radiotaxi Praha, however AAA Taxi cabs charge up to four times more for a ride, they even do not provide services to Czech customers. Visitors are advised to use the services of proved phone-order taxis, as they are even reports of robberies with street cruising taxis. If you don't speak Czech, then be prepared: There is about a 50% chance you will be cheated by the driver, if you hail a taxi in the city center. If you are convinced you got overcharged by the taxi driver, mark the car ID numbers (license plate, taxi license number on the car door, driver name, etc.) and contact the company which the driver is working for (if any) or police. The problem is that you have to testify against the driver, which is kind of hard when you're on the other side of the world. Try to avoid suspicious taxis and when in doubt, walk away and catch another taxi. You can travel down the famous Vltava River (Moldau, in German), which inspired writers and composers such as Smetana and Dvorak. The Prague Steamboat Company  offers sight seeing cruises as well as trips to the Prague ZOO or the Slapy River Dam. 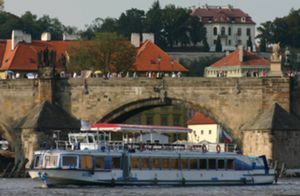 There also few small passenger ferries across the river , integrated to the Prague's public transport tariff or a Wine Boat  on which you can taste local wines. Panorama of Prague Castle, Charles' bridge and Mala Strana, compiled with Hugin from different photos. Prague Castle  (Pražský hrad); This is the biggest ancient castle in the world, according to Guinness World Records, and rises like a dream above the city offering beautiful views of the areas below. Also on site is the St. Vitus Cathedral with its lookout tower, the Castle Picture Gallery , several palaces and museums and the beautiful Royal Garden, among others. You can also watch the Presidential Guard, and the changeover of the guards on duty on the hour. A Prague castle ticket is 350 CZK and an audio guide costs a further 350 CZK. A useful tip could be that while entering through the main entrance (U Prašného mostu), the first ticket counter that one finds is small and usually crowded. If you just walk inside there is a much larger counter with multiple desks inside a room which is easy to spot too. Charles Bridge  (Karlův most) connects Old Town with Lesser Town. 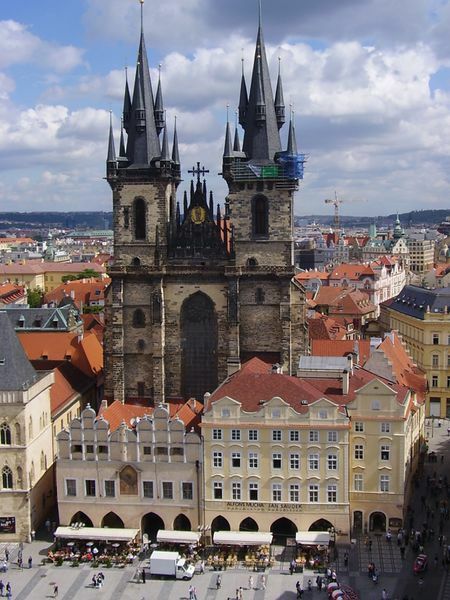 Its construction started in the 14th century and it is one of Prague's most beautiful structures. During the day, it is a bustling place of trade and entertainment, as musicians busk and artists sell their paintings and jewelry. Old Town (Staré město); Prague's historic centre includes numerous historic buildings and monuments, most notably the famed Astronomical Clock (Orloj), the pure Gothic Týn Church, the mural-covered Storch building, and the Jan Hus monument. Nearby, the Estate Theatre is a neoclassical theatre where Mozart's opera Don Giovanni was first performed. Old Town features many historical churches (St. James Church, Church of Our Lady before Týn among others) and some other interesting historical buildings like the Old Town Hall. Josefov; this historic Jewish ghetto is interesting for its well preserved synagogues. The Old New Synagogue (Czech: Staronová synagoga) is Europe's oldest active synagogue and it is rumoured to be the resting place of the famed Prague Golem. Another interesting synagogue is the Spanish Synagogue, a highly ornamental building of Moorish style. Other attractions include the Old Jewish Cemetery, which is the oldest in Europe, and Kafka's house. The Old New Synagogue is NOT a part of the Jewish museum, so if you wish to see everything, it is recommended that you buy a combined pass to all of the Jewish attractions  for 480 CZK. New Town (Nové město); New Town was established as an extension of Old Town in the 14th century, though much of the area has now been reconstructed. The main attraction here is Wenceslas Square, a rectangular commercial square with many stalls, shops and restaurants. At the top of the square is the National Museum which is well worth a look (see below). Midway down this historic boulevard, one finds trendy discos and Art Nouveau hotels, as well as quaint parks and arcades, while just off the beaten path are some wonderful panoramic views (Henry Tower), romantic restaurants and the dazzling, Disney-colored Jubilee Synagogue. Lesser Town (Malá strana); Across the Vltava River from the city centre and leading to the castle, this quarter also offers beautiful streets and churches (of which St. Nicholas Church is the most renowned). The Lennon Wall, which used to be a source of irritation to the communist regime, is also found here, near a Venetian-like canal with water wheel and close to the Charles Bridge. Infant of Prague (Jezulátko) . This famous statue of Christ, known also as the Holy Infant of Prague, is among the most widespread religious images in the world. The original statue can be seen in the Church of Our Lady Victorious in Lesser Town. Loreta . A beautiful Baroque convent in the Lesser Town. Strahov Monastery  (Strahovský klášter); A monastery on the mountain. Worth a visit for both its picture gallery and its notable Renaissance library. Prague Dancing House (Tančící dům) also known as "Fred and Ginger"; one of the most fascinating architectural expressions of Prague co-designed by Vlado Milunic and Frank Gehry. Accessible from Karlovo náměstí metro station. Vyšehrad . A nice castle well worth a visit. 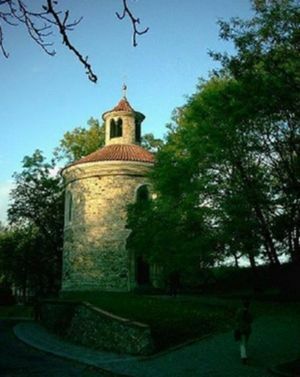 Petřínská rozhledna . A smaller version of the Eiffel Tower on the top of Petrin Hill overlooking Prague. Climbing the tower costs 120 CZK for a standard ticket or 60 CZK for discounts. Paid lift available (60 CZK). Prague Giant Metronome— A huge monument erected to replace the Stalinist monument that preceded it. Memorial to the 1989 Velvet Revolution— A simple brass plaque at 20 Narodni. From Cafe Louvre, walk toward the river. You will enter an archway, and after just a few meters, look at the wall on the left. 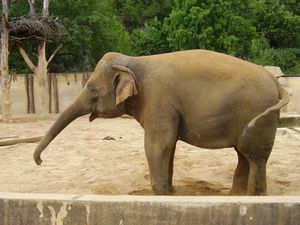 Prague Zoo . To get there, take Metro C to Nadrazi Holesovice, then bus 112 which terminates at the Zoo. Nearby is the Troja Chateau (Trojský Zámek) with a large garden displaying various sculptures and a Botanic Garden  (Botanická zahrada Troja) with a tropical greenhouse. Prague christmas markets. The atmosphere of the Prague Christmas market was then enriched by fairground attractions, there used to be singers who showed the horrific scenes illustrating the songs stories. Vitkov Hill . Climb up the Vitkov hill to reach the National Memorial and the surrounding landscaped garden from where you can have a beautiful view of Prague skyline. Czech National Gallery (Národní galerie). Its most important collections are in the Sternberg Palace (up to to the Baroque), St George Convent (Czech Baroque and Mannerism) and Veletržní Palace (19th century and modern art). The first two are located near and in the castle respectively. Do not confuse them with the Castle Picture Gallery (see above) which is worth visiting on its own right. Also interesting is the Museum of Czech Cubism at the House of the Black Madonna in the Old Town (closed as of April 2013). Czech National Museum (Národní muzeum) . An association of various museums. The main building is at the Wenceslas Square and is dedicated to natural history (this branch is closed until 2017). Other branches include museums of the Czech composers Dvořák and Smetana, Czech Music Museum, Historical Pharmacy Museum, Prince Lobkovicz' Collection at the Prague Castle, Czech Ethnographical Museum and Naprstek Anthropological Museum. Prague City Gallery . A museum of modern Czech arts divided between several sites most of which are in the old town. Its main building is the House of the Golden Ring at the Old Town Square featuring 20th Century Czech art in a beautiful medieval edifice. 19th Century Czech art is exhibited at the Troja Castle. Czech Museum of Fine Arts . 20th Century Czech art and changing exhibitions. Museum of Decorative Arts . This 17th century palazzo-style building houses examples of historical and contemporary crafts, as well as applied arts and design. National Technical Museum (Národní technické muzeum) . Amazing collection of motorcycles, cars, aircraft and commercial vehicles, plus many examples of communist-era technological engineering. Reopened in February 2011 after extensive renovation works. Military Museum . Showcases the uniforms, artifacts and maps relating to the Czechoslovak armed forces during World Wars I and II. Jewish Museum . This covers six separate places (four synagogues, the Old Jewish Cemetery and the Memorial Hall) but does not include the Old-New Synagogue, although entrance tickets can either include or exclude the last named. The Old-New Synagogue is expensive in relation to the museum but in view of its age, it's worth including it. The Memorial Hall is particularly moving with exhibits of the writings of children in death camps. Mozart and Dušek Museum . Dedicated to the works of Mozart. The Museum of W. A. Mozart and the Dušeks is closed from November 1st, 2009 until further notice. Prague City Museum (Muzeum hl. m. Prahy) . An absolute must-see for the incredibly detailed cardboard model of nineteenth century Prague by Anton Langweil. The detail is amazing, even down to the colour of the doorways and the design of the windowsills. Mucha Museum . A museum of the Czech artist Alfons Mucha. Kafka Museum . There is also a permanent exhibition at Kafka's house. The Pedagogical Comenius Museum . A museum documenting the writings of the Czech Renaissance erudite. The Mueller Villa . A work of art of the well known Viennese architect Adolf Loos from the beginning of the 20th Century. Museum of Communism . Interesting exhibits on how Communism changed Czechoslavakia, but skewed toward a particular view of history (though this is the way most Czechs see it). Karel Zeman Museum . The Karel Zeman Museum presents the life’s work of the world renown film maker Karel Zeman and his cinematic special effects, which made Czech cinematography world famous in the 20th century. A substantial part of the museum is dedicated to his most significant films – Journey to Prehistory, An Invention for Destruction, and Baron Munchausen. Museum also provides workshop of animation and special film effects. The museum’s playful approach to the exhibition is unique, it allows visitors to participate directly - to try out with their own photo and video cameras selected special-effect techniques that Zeman used in his films. There are plenty of smaller museums. Among them are the Miniature Museum at the Stahnov Monastery, Toys Museum and Musical Automata Museum at the Prague Castle, Wax Museum, Torture Museum, Postal Museum and Brewery Museum at the Old Town and the Aviation Museum at Kbely. 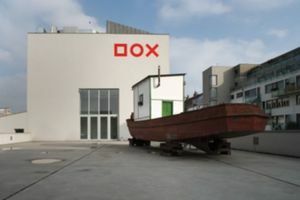 DOX - Centre for Contemporary Art . Newly opened gallery for modern arts, modern EU gallery style. Huge white building with lot of exhibitions, installations and interesting objects to see. Located at Poupětova 1, Praha 7 near industrial district Holešovice (subway red line C) is quite long way from the center but definitely worth to see. You can check the exhibitions during day (around 1-2 hr) and on the trip back to Holešovice visit the legendary underground grown up Cross Club . Museum Kampa . A museum of modern Central European art. Jaroslav Fragner Gallery , contemporary architecture. You can find here profiles of influential people and groups, retrospective exhibitions, thematic exhibitions, recent movement in architecture. Gallery provides lectures, seminars and publishing, regarding central Prague the JFG became a centre for architects, professional and general public, students of architecture and construction companies. Prague Card . All-top attractions inclusive tourist card with tradition since 1991, is valid for 4 days and grants free entry to over 50 top attractions in the Prague area. You will receive a book with information on all the free attractions and many discounts (Prague Walks excursions, airport transfer, shopping, Mucha and Kafka museum etc.) and a voucher for each attraction. You can only enter the attraction with a valid card AND a voucher. The card does not include public transport and a separate ticket will have to be bought. The Prague Card costs 790CZK. You will not save much with this card. With the Prague Card you can visit Prague Castle (350 CZK), Old Town, Malá Strana and Charles Bridge historical towers and other attractions, Observatory (20 CZK), small copy of Eiffel Tour (100 CZK) and Mirror Maze at Petrin Hill (90 CZK), Vysehrad all castle including his casemates and gallery, many New Town Museums and Galleries and several castles outside centre of Prague. Welcome Card TVCzechia® . Free admission to Prague castles and towers as well as a lot of discounts in Prague and Karlovy Vary region. 990CZK. Card Benefits Of note is that the card will grant admission to all the Prague Castle short tour, which normally costs 250CZK. Many of the town's museums and galleries--including all branches of the National Gallery and the National Museum--are also included, and over four days you can easily see 3 times the card's value. As such, this is an excellent choice if you're planning on visiting a lot of museums. The only major attraction that is not included is the Old New Synagogue and Jewish Museum. Prague Pass . Will give you free entry to various attractions in Prague within a 1 year period, various discounts, sightseeing tours and 72 hours of public transport, including metro, tram, bus, funicular, and train all for 860CZK. Also in your pack is a free map of Prague and a program guide booklet as well as a free welcome present. You will also receive discount coupons for several discounts of up to 50% for guided sightseeing- and city-walking tours, Mozart museum, galleries, concerts, internet use, computer games, real laser game or for Rent a Car (25%). National Gallery Gift Ticket— If you are an art lover and you are staying in Prague for a longer time, a dárková vstupenka (gift ticket) for National Gallery may save you money. The ticket is valid for a year and is valid in all exhibitions (both permanent and non-permanent) of National Gallery. Number of visits is not limited. A gift ticket for one person costs 650 CZK, for two persons 1000 CZK. For 240 CZK you can have one-person ticket valid for two days in all "Old Art" exhibitions of National Gallery (Šternberk Palace, Schwarzenberg Palace, St. Anežka Convent), basic entry for these three galleries bought separately would cost you 450 CZK. Or in some days you can go for free with Free admission days. One of the most popular activities in Prague is the escape room challenge. This is recommended for groups of 2-5 people. As the escape room is an indoor activity, this can be planned in advance independently from the weather condition. Most popular activities among the locals and tourists are the Puzzle Room Prague, Getaway Prague, Escape Room. Questerland and Mazement. 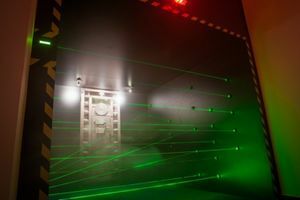 Real-life escape games are interactive games where players need to escape a room within 60 minutes by finding keys, codes, interlinking different objects, solving puzzles and riddles, all while cooperating in a team. They provide the challenge in an authentic environments and give the players the feeling of travelling in time. The activity is a perfect entertainment for couples, group of friends or for families. Beer is the liquid bread of the Czech nation. Pilsner or Pils is the world’s first blond lager and the most popular beer style in the world! Therefore beer tourism is so iconic for the Czech Republic. Nowadays beer is on the rise thanks to the boom of microbreweries in the region. On beer and brewery tours you can beer taste various beer styles (especially traditional Czech pilsner and dark beer), eat typical lunch/beer snacks, experience the brewery tour and learn about the specific Czech brewing process or just have fun while drinking a beer. Mostly you will do some sightseeing along the way as well. Johnny's Prague Photo Tours, ☎ (+420)737382203  - Explore the best places for photography with a local professional photographer. You can take sunrise and sunset tours that take around 3.5 hours and offer you to shoot when the light is at its best. Tour covers not only some of the main sights, but also interesting locations off the beaten path. The tours are always tailor-made to fit client's needs and expectations. Learn about photography, enjoy friendly and knowledgable guides and bring home stunning pictures from Prague. Street Photography Prague,  - Experience the richness of the local culture through the eyes of your camera. Street Photography Prague organizes one and two-day courses for those with an interest in street photography. All courses include guided exercises, theory and guided street photography. Learn why gear is the ultimate distraction, and your skills are the solution. Prague has more than 120 kilometer of bike paths to its disposal. This makes Prague a suitable city to discover by bike. Nowadays Prague can be seen as a real cycle city. This is confirmed by the great offer of cycle services and centres. There are several bicycle garages, bike rental and bike tour companies making cycling in this city change for the better. For more information and exact rules concerning cycling in Prague you can take a look at this website . If you want to discover Prague on your own, this is possible by renting a bike. However, if you want to explore the city and learn about culture and history it’s recommended to do a guided bike tour. A few biking tour companies which give bike tours as well as they offer the possibility to rent a bike are Baja Bikes, Biko Adventures, MTB Prague. By doing a bike tour you’ll get familiar with the city’s highlights and its history in a few hours. Praha Bike - tours & rental, Dlouha 24, Praha 1 ☎ +420 732 388 880  Praha Bike is the biggest bike rental in Prague and in the Czech Republic. Praha Bike offers bike rental or bike tour Open 9:00 to 21:00, from March to November. BIKO Adventures Prague, Vratislavova 58/3,Vysehrad Prague 2. ☎(+420)736441710 . BIKO offers outdoor activities "off the beaten track" in Prague and in the Czech Republic and high level mountain bike and road bike rental. Mountain bike and road bike tours from easy to advanced in and around Prague, to Karlstejn castle and in Singltrek pod Smrkem, the best MTB trails in central Europe, with high level bikes. Urban hikes in Prague, in Karlstejn and to the Czech Paradise, a UNESCO heritage site. Sightseeing running and trail running tours and cross country skiing tours. BIKO is open all year long. However the shop is open 7 days a week from April to October from 9.00 a.m. to 6 p.m. From November to March BIKO handles everything online and the guides go to the shop only in case of tours so it is better to drop an email or call. There are different price options according to the tour level (easy or advanced), the number of participants and the bike options chosen (you have your own bike, standard and high level MTB. Also at BIKO shop you can find design t-shirts about Prague and the bike culture, a great souvenir from Prague. Prague By E-Bike Sightseeing Tours, Nosticova 6, Prague 1. ☎(+420)603993393. Prague By E-Bike offers daily morning and afternoon guided Prague sightseeing tours on electric bikes. Prague By E-Bike Tours are a personalized way to discover historic Prague, with a limit of 8 participants per tour. Our eBike Prague tours take approximately 3 hours and include a training, a complimentary helmet and a soft drink. Regular tours are in English. French on request. Open from April to November. We Bike Prague, Petrska 8, Praha 1 ☎ +420 773 912 010  This bike company offers single daily bike rental, Prague bike tour and multidays cycling tour in the Czech Republic. This company is the only one which offers a complete tour of Prague with a perfect combination of biking and walking routes, including the interiors part of Prague castle. as well you can customize with this company any kind of cycling trip for 3 up to 18 days in the Czech Republic or in central Europe. BiHi Prague ☎ +420721038871 BiHi Prague. From Prague you can easily get by car to the Czech Mountains where are the best bike parks from central Europe. For the adrenaline and technical trails enthusiasts here are the best bike parks in Czech Republic located just 2 hours away from Prague: Trutnov Trails, Singltrek pod Smrkem, Rychleby Trails. BiHi Prague is specialised in organising private and custom made MTB tours and MTB vacations in the Czech bike parks. Transphere bike rentals and tours, Janáčkovo nábř. 9, Praha 5 ☎ +420 774 045 696  Small, highly personalised bike rental service in the Anděl neighbourhood by the riverside. Mostly simple city and hybrid bicycles, some vintage bikes, including steel frame road bikes. Very reasonable rental fees, personal approach and friendly, helpful staff. Unique city tours guided by local journalist, combining walking, cycling and public transport (trains, boats). Bike and luggage transfer service for multiple day bike tours (Česky Krumlov, Dresden,Vienna, Berlin etc.). If you are tired from walking or just don’t have enough time this is your best option. Riksha can get into nice old tiny streets and parks where you can’t get with buses or cars. It is also very personal and flexible. You can discuss the route before departure. Most rikshas are on Old Town Square or you can also make order in advance. There are many opera and Black Light Theatre companies in Prague. Prague is so called "home" of black light theatre. There are several performance groups that cater to tourists. They aren't strictly to be avoided, but common sense should tell you that the opera advertised by costumed pamphleteers is not going to be up to truly professional standards. Ungelt Jazz & Blues Club . HILT black light and shadow theatre . Prague Folklore Days- the biggest folk dance festival in central Europe . Prague Advent Choral Meeting . River cruises are both popular and varied, from one hour cruises to long evening cruises with dinner or music. Prague Flights  Offers sightseeing flights by airplane, helicopter or in hot air balloon and tandem skydiving. Treasure Hunt Prague  Treasure Hunt Prague is a dynamic team competition, that makes use of modern technology and GPS-enabled tablets and let's you visit a wide range of historical monuments in Prague in a record time. Suitable for larger groups and companies. Prague Sports gives you the chance to play a range of sports from football, cricket, rugby union, and hockey in Prague. Packages can be tailor-made to include accommodation, transfers, activities etc. For the travelers who wants to get a real taste of Prague, you can join real native people that will show you their city around. Everyday with small groups they share their passion of the Magical city during 90 minutes walking tours. This service is free, guests choose their tip. Learn about the main landmarks but also the everyday life, the best addresses from young energetic, fun and educated guides. The streets around the Old Town are full of gift shops aimed towards tourists, selling Bohemian crystal, soccer shirts and other mass-produced memorabilia. The thoroughfare between Charles Bridge and Old Town Square is particularly bad, turning off into one of the laneways you can find the exact same merchandise for half the price. If you are looking for some decent souvenirs, try to get off the beaten path. Street vendors can have some unexpected treasures and there are plenty in the Charles Bridge area. Prints of paintings and good quality photos are very popular, and a really good way to remember Prague. Don't bother buying overpriced furry hats and Matryoshka dolls, though, because they have nothing to do with Prague - they are Russian in origin, and their sellers are just trying to make money out of oblivious tourists. 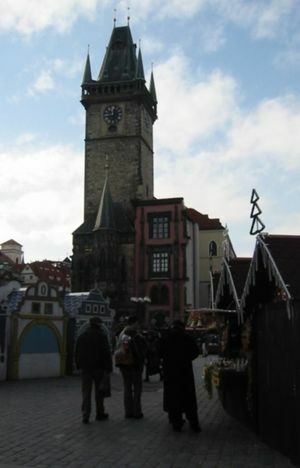 In December, the squares host Christmas Markets selling a mix of arts, craft, food, drink and Prague memorabilia. The markets are an attraction in their own right and a great place to pick up a more unique memento of the city. There are several large shopping centres in Prague, you should take "Na Prikope" street - the eighteenth-most expensive street in the world (measured by the price of property), with famous shopping arcades "Cerna ruze" (Black rose) and "Palac Myslbek" and many shops. If you are looking for souvenir shops, you will find them in the city's historical centre - mostly around Old Town Square, Wenceslas Square and Prague Castle. There are many other shops offering Bohemian crystal - especially in the centre near the lower end of Wenceslas Square. The other typical (if rather expensive) Czech goods is the garnet jewellery - typical Czech garnet stones (gathered near the town of Turnov) are dark red and nowadays are produced by a single company - Granat Turnov - and if you buy genuine traditional Czech garnet, you should get a certificate of authenticity. "Pařížská" street goes from Old Town Square towards the river - and includes some of the most luxurious (and expensive) boutiques in Prague. Palladium - situated directly in the city centre, it's the newest and perhaps most luxurious shopping mall. On the top level (+2) are some moderate to expensive restaurants and a food court with McDonald's and a few other options. Tram/metro station Namesti Republiky. OC Letňany - the largest shopping mall in Czech Republic located near metro station Letňany (free of charge OCL and T,E,S,O bus). In addition to famous brand shops, this shopping mall has a cinema, aqua centre and even an ice rink. OC Chodov - a huge shopping mall with hypermarket located slightly further away from the centre at metro station Chodov. Šestka - new shopping mall just one station from the Prague Airport. Very far away from the centre, but ideal for last minute shopping before your departure. Take bus 119 from Dejvicka metro station. Palác Flora - medium-sized shopping mall with an IMAX cinema on the top floor. Tram/metro station Flora. OC Nový Smíchov - big shopping mall with two-floor Tesco hypermarket, a cinema, bunch of fast-food restaurants on the top floor and very close to metro/tram station Anděl. Metropole Zličín - medium-sized mall with a cinema, hypermarket Interspar, fast food outlets, huge car park and near the metro/bus station Zličín. If you are hungry after your flight, take a 100 bus from the airport to Zličín and then just walk few metres to this mall and buy something to eat. There are several interesting design shops in Prague. All of them are worth visiting when wanting to treat yourself or searching for gifts and souvenirs. BOTAS 66 store – Original Czech sneakers since 1949. Retro sneakers from the Communist era with a fresh modern award-winning facelift. Handmade in the Czech Republic. Křížkovského 18, Praha 3 (right next to Žižkov TV tower) and Skořepka 4, Praha 1. Sometimes it is also possible to pay with Euros (hotels in the centre of Prague, McDonalds, KFC, Marks & Spencer, Albert and Billa supermarkets, etc. also accepts British pounds), but the exchange rate may be slightly unfavourable and change is almost always given only in Kč. 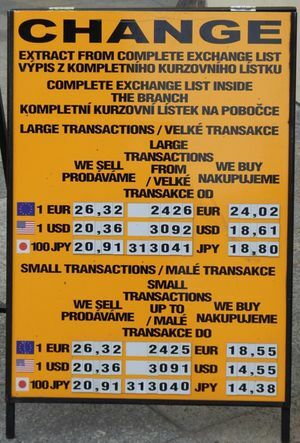 In Prague, especially around tourist sights, there are plenty of Exchange offices with very bad rates which also charge commission. Be sure to always ask the employee how much money you would get before you give them your money – there might be some commission fee included which might not be easily visible at first sight. It is also advisable to ask at several nearby Exchange offices before changing your money. The best place to exchange money is at eXchange  office located in the centre of the city is in Kaprova Street 14/13. If you take a print out of the VIP coupon from their website you would receive the preferential VIP rates. The office is open till 20:00. One of the best rates are found around Main Railway Station (Hlavní nádraží) – exit the station, left across the park, to street "Politických vězňů". There are about 5 offices, mostly arab-owned, and offer very good rates even for smaller amounts, and even better or negotiable for higher (over 1000 EUR, USD or such). A very good exchange place is to the left of Palladium Shopping Centre's main entrance, it's called Alfa Prague. With VIP rate probably the best place in the centre. Generaly, most exchange places have websites where you can download a picture of VIP voucher which, when printed and presented at the exchange office, will allow you to use VIP rates which are better deal. Some ATMs in the city will charge a commission. ATMs owned by major banks and ATMs outside tourist places usually do not; Unicredit and Raiffasen ATMs do not charge commission and give you the standard exchange rate. If ATM charges commission, it is usually printed on the screen at the last step before you take your money. Also some ATMs try to force a specific exchange rate on you via "dynamic currency conversion" by offering to charge your card in your home currency. The exchange rate in this case is set by ATM, and unless your bank is a total ripoff it is always worse than your bank would charge you. Decline the "offer" to charge your card in non-Czech currency. 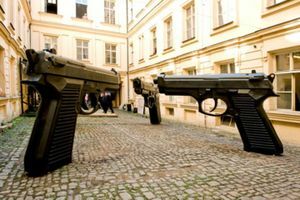 UNDER NO CIRCUMSTANCES SHOULD YOU CHANGE MONEY ON THE STREET Organized gangs operate in central Prague near exchange offices and target unsuspecting tourists by offering a better rate. Instead of giving you koruna, they will instead give you another currency, such as older Byelorussian rubles. In other cases, one of them will take your money when offering to trade, whilst one of their accomplices distracts you. When you realize that the rate is unfavorable and take back your money, you will instead find that they have given you a worthless Czechoslovak banknote. The best way to stop those gangs is to simply avoid anybody on the street who offers to change money. It is extremely useful to carry around a fair amount of cash, because not every place will take cards. However, the museums and most sizable restaurants do accept credit cards, and that is probably the best way to get a fair exchange rate. If you arrive early, there are money exchange machines at the airport right outside the customs on arrival. Those machines only accept Euro bills and they don't give change. The exchange rate is bad, and the machine charges hefty 10% commission. However if you need money for the bus to the city and only have cash this would be your only option. Make sure you have a 10 Euro bill for the machine, which should be enough to get you anywhere into the city by using public transport without wasting too much money. Self-service ticket machines are found at the bus stop outside Arrivals. Chip and pin and contactless payment is available. No additional charge is added so if your card doesn't charge you for payments abroad you will pay the normal price. Every weekday between 11am and 2pm you can enjoy a discounted lunch menu in almost every restaurant in Prague. As a tourist you'll encounter a few barriers: the menu is in Czech only and the waiters will be reluctant to present you with a copy of it unless you explicitly ask for it: 'denni menu, prosim'. After that it's up to your luck on what to pick, but it's gonna be a nicely cooked typical meal and will cost under €5, sometimes a soup included as well. Lunch is traditionally the main meal in Prague. Czech cuisine is typically based around pork or chicken with starchy side dishes such as dumplings, potatoes, or fries. Fish and beef is not as popular, though nowadays it is widely available. Popular Czech desserts include fruit dumplings (ovocné knedlíky), crêpes or ice cream. Most restaurants become very crowded during lunch and dinner, so consider making a reservation or eating earlier than the locals. The tip should be about 10% - in cheaper restaurants or pubs you can get away with rounding up the bill or leaving a few extra coins. Otherwise it's customary to leave at least 20-40CZK or €1-2. Taxes are always included in the price by law. Many restaurants in heavily-touristed areas (along the river, or with views near the castle) will charge a cover or "kovert" in addition to your meal charge. If this is printed in the menu, you have no recourse. But a restaurant will often add this charge to your bill in a less up-front manner, sometimes after printing in the menu that there is no cover. Anything brought to your table will have a charge associated with it (bread, ketchup, etc.) If you are presented with a hand-scrawled bill at the end of the meal, it is suggested that you take a moment to clarify the charges with your server. This sort of questioning will usually shame the server into removing anything that was incorrectly added. It should be noted that some waiters are impolite especially to people from the Eastern part of Europe. Pay no attention to this, and simply find another restaurant. If you're on the look out for fast food, you won't be able to move without tripping over street vendors serving Czech style hot dogs and mulled wine in the Old Town Square and Wenceslas Square in New Town. If you're after Western-style fast food, the major chains also have a large presence in Wenceslas Square and the area immediately around it. Most beer halls also serve light snacks or meals. Definitely try the hot dogs (párek v rohlíku) - they're far superior to the greasy, messy version you get in the West. Small, hollowed-out Czech rolls are used for the bread, filled with mustard and ketchup, and then the frankfurter is inserted afterwards. This turns the bread into a convenient carry-case and means you don't get ketchup all over your hands. Make sure you get mustard, even if you don't normally like it - unfortunately the hot dogs are somewhat flavourless and need that extra bit of kick. Prices range from around 15 koruna for a small one to 45 koruna for the terrifying-looking 'gigant'. Note that size of hot dog relates to girth rather than length. Try the trdelnik, a traditional tube-shaped pastry, which can be found at street vendors in the Old Town for 50 koruna. Beware of street vendors in Wencelas Square. Some of them will target tourists by providing them with extra products they did not ask for and not giving enough change. These stalls are also by far the most common place for tourists to get food poisoning in Prague. Czech is the official language of Prague and the Czech Republic. Simple words and phrases in other Slavic languages (for example Bosnian/Croatian/Serbian and Polish) are also commonly understood. Slovak can also be acceptable to a high extent, as Czech and Slovaks have historically understood each other without the need of a translator. Both languages are very similar and mutually intelligible to a very wide extent. Most young people speak English very well, you will also have no problem speaking English at restaurants and bars. Many restaurants have English menus. The people at counters in train and metro stations, and police officers rarely speak English. Russian is widely understood by people who were attending school before the Velvet Revolution in 1989, but the language is too different from Czech to be understood without study. In addition, some people may dislike using Russian even if they know it because of the Soviet occupation of the Czechoslovakia in 1968 and Communist history in general. Many Czechs also have some knowledge of German. People studying after 1989 and even some older people can speak English. However, learning Czech will surely endear you to the locals. Beer is by far the most popular drink in Czech Republic, so it can be bought literally everywhere. The Czechs usually prefer lager beer, similar to traditional German Reinheitsgebot one, so don't expect to find a lot of ale taps in local breweries, after all, it is completely different beer culture. Pubs (in Czech "hospoda") abound throughout Prague, and indeed are an important part of local culture. The exact brand of beer usually vary from pub to pub, and recommendations are difficult to give as natives are usually willing to argue at lengths about their preferences. The most internationally recognized beers are Pilsner Urquell (Plzeňský Prazdroj) and Budweiser Budvar (Budějovický Budvar). There are other brands famous among Czechs like Gambrinus. If you are looking for a beer brewed in Prague, go for Staropramen. Usual prices for a half-liter glass are between 20 and 35 CZK, based on the brand and locality, while certain restaurants at tourist areas like the Old Town Square are known to charge more than 100 CZK for an euro-sized glass. At a grocery store a half liter bottle may cost 15 CZK. Drinking in public is illegal in Prague, but if you are not drunk and disorderly, or in a large group, it will probably not cause trouble. Don't be afraid to experiment with different beer brands, even if they are not mentioned in this article. In Prague it is customary, especially at beer halls, to sit with a group of people if there are no free tables, so go ahead and ask if you can join. Prague has also many excellent tearooms (in Czech čajovna) which serve different kinds of teas from around the world. 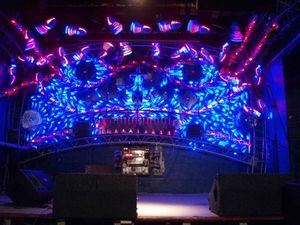 Clubs Prague is home to many different clubs, from 80s discos to 5 story clubs. You will always find something happening in Prague, with most places having some sort of an event every single night. Most places have free entrance, especially during the week. The top two rated clubs in the city are One Club Prague and Ace Club. One has more of a house dance style theme and the other one is R&B. Prague has a wealth of accommodation options, many of them within walking distance of the town centre. Peak season generally runs from April to October and a major influx of visitors can be expected during New Year as well. Prices for accommodation can be up to twice as high in the peak season and reservations are advised. Otherwise, the main train station, Hlavní nádraží, has an accommodation booking service for hotels and hostels upstairs. Normally, tax and breakfast are included in the room rate. Around Hlavni Nadrazi, the main train station, there are many touts offering cheap accommodation. Many are Czech residents renting part of their apartment for extra cash. Prices don't vary much between them, but some may not be trustworthy so be cautious. Check out for reviews of the Apartments and Hosts. Even during peak season, dorm rooms in hostels close to the city center can be had for around 350CZK per person per night. Prague has its share of rough and ready youth hostels with a party vibe, but there are many with a more relaxed atmosphere and some housed in beautifully restored buildings as fancy as any hotel. Many hostels also offer private rooms, with or without shared bathrooms, for much cheaper than a pension or hotel room. There is a boutique design hostel movement with many hostels rivaling hotel accommodations. For those looking for something a little different, a 'botel' (boat hotel) may be an appealing option. Usually relatively well placed, with gorgeous views. Most are moored on the south of the river in Praha 4 and 5, but the best is to stay in Prague 1, next to monuments to visit by foot, in the Lesser Town district (Mala Strana) or in the Old Town (Stare Mesto). Prices vary from €20 to €120 per person. Prague 3 is easy accessible to Prague city centre and prices are very friendly, there are lot of hotels mostly 3 stars with low prices, double room in season á 60,-Eur low season á 28,-Eur include breakfast. Most of hotels and vacation rentals are on line tram number 9 from Venceslas Square. EU citizens can work in the Czech Republic without a work permit, but it is necessary to be registered at a Labour Office (your employer should register you at the beginning of your working stay). Prague is probably the best place to foreigners to look for a job in the Czech Republic, because there are many multinational and English-speaking companies. It is quite easy and cheap to buy a local SIM card with 4G LTE access. Packages vary so check before purchasing. Many hostels and hotels offer free internet on shared computers or over a wireless network, so ask before you shell out extra at one of Prague's many internet cafes. Almost all McDonald's, Burger King and KFC fast food restaurants offer unsecured, free WiFi networks to paying customers. Most other restaurants and cafes offers free WiFi as well, often without advertising - check for network with name of the establishment and ask the personnel for password. An internet cafe located at Spálená 49 (Metro B & Tram: Národní třída) is open until midnight every day and offers printing facilities. Grial Internet Cafe, Belgická 31, Vinohrady, Prague 2, tel. +42 0222 516 033, [email protected],. The nearest metro station is Náměstí Míru on the A line. M-F 09:00-23:00, Sa Su 11:00-23:00. Grial Cafe serves hot and cold drinks, including alcohol, and scanning, printing and CD/DVD burning are available. Internet access is 40CZK per hour. Internet Cafe Interlogic, Budějovická 13, Praha 4, tel. +42 0241 734 617, [email protected] . 10:00-22:00 daily. 12Mbit/second internet connections, couches and drinks. 1CZK/min. Blue Mail, Konviktská 8, Praha 1, (Old Town), tel. +42 0222 521 279, [email protected] . M-F 10:00-22:00, Sa Su 10:00-23:00. The first five minutes is free and an hour of access will set you back 81CZK. The most common crimes in Prague by far are car theft and pickpocketing: the prevalence of car theft and vandalism pushes up the crime statistics of Prague. But even if you do not drive, pickpocketing is common in Prague, and some violent crimes do occur in this city. You are seriously warned not to provoke drunken people as it will put you in extreme danger. Begging is a serious problem in this city and you can even see beggars in this city's top tourist attractions. Don't carry a wallet or purse in the back pocket of your trousers; always keep an eye on your items; don't put all your money in one place; don't show your money or valuable things to anybody; don't walk alone into deserted areas even if you feel able to protect yourself. Better safe than sorry; so take precautions. Possession of drugs has historically been a grey area under the Czech jurisdiction. Since early 2010, though, the dubious term "an amount less than small" has been finally transformed into absolute values based on the actual judicial practice and it is no longer an offense to carry less than 15 g of marijuana, 5 patches of LSD, 1 g of cocaine. It is still a criminal offense to posses more than the allowed amount of drugs. Bear in mind that for possession of lesser amounts you might be still fined by public authorities as it is an offence (though not criminal one). Please also note that most bars will expect you to go outside if you intend to smoke a joint. Be aware of teams of pickpockets that lurk outside metro stations, overcrowded trams, Charles Bridge, Wenceslas Square and the Old Town Square. They usually work in teams of 3-5 and look for lost or distracted tourists. Backpacks are especially interesting to them. Many of those groups use underage children as pickpockets because they are not liable according to Czech criminal law. Due to the low incidence of violent crime, the threat of pickpockets has been played up as a great problem. However, common sense and basic precautions can keep most people safe from pickpockets. If you have a camera, try not to wear it openly. Always close and secure your backpack and try to keep an eye on it. Be especially careful not to fall asleep in tram or metro. Wear your wallet in a safe place (like inner pocket of your coat), never put it into your rear pocket or any other place where it can be easily stolen. Be astute on sleeper trains, as bag robberies are on the increase between major stations. Ask for ID from anyone who asks to take your ticket or passport, and lock backpacks to the luggage racks. Keep valuables on you and maintain common sense. If you enter the metro (usually at night), you may find a team of con artists at the stations, saying that they are metro clerks and, after examining your ticket for some time, that it's invalid so you'll have to pay a fine of 500 CZK (1000 CZK if you argue with them). So if you happen to see them and you're sure that your ticket is valid, tell them to call the police, or call them yourself. Remember that Prague Metro ticket inspectors have to produce their badge in order to check your ticket and issue a fine; if they don't do this as soon as they approach you then, they are almost certainly fakes. In fact, such groups have been cracked down in the past. Usual pain of otherwise perfect public transportation in Prague system are their ticket inspectors. They are paid with minimum wage and on the top of their salary is commission of fines paid in real so in the most cases they choose tourist group to secure their income. Here is described how they should behave to a passenger without valid/incorrectly valid ticket. They ask you to pay fine. If you don't pay fine, they ask you to present your pasport or EU ID card. If you don't produce your document (it is not your law duty), they will call police and you have to present them your document and they will forward your details to a ticket inspector. After ticket inspector obtains your details in any way above, then he/she fills in the "record of transport inspection" form. After that don't sign this form and just take copy. Then you can pay fine in the penalty fare desk or by bank transfer (for low bank fees from abroad you can use Skrill or PayPal). Big scam is that ticket inspector takes personal document and forcing you to pay in the cash on the spot and he/she will happily follow you to the nearest atm machine or exchange office. Of course they will lie about non existence of the possibility to pay by bank transfer. They just take your document and checking another passengers until time you say: I will pay now. Call 112 and ask for the presence of the Police in the case your documents are being held for the purpose of paying on the spot. If you are witness of such a behaviour, raise official complaint to the transportation company (ROPID, Rytířská 10, 110 00 Praha 1, Czech Republic) and in the best case don't forget to take video on your mobile device. Also notify about such a behaviour your country's embassy in Prague by email. Ticket inspector is just an employee and has no legal power and also not paying fare has no criminal background like in some countries. It is just debt between you and transportation company. This article is not made for fare dodging but main for the purpose to understand your rights. Be careful with taxi drivers, particularly from the train station, and particularly of the Škoda brand. Taxis that are legally registered may still be mafia-run affairs that do their best to overcharge. It is illegal for a taxi driver to refuse you a receipt in Prague, so agree to a price before putting yourself or your luggage in the taxi. The risk of overcharging is greatly overplayed but just take the usual sensible precautions of only using taxi firms affiliated with the station or your hotel, or call a reputable company and wait. Finally, if presented with a wrong bill from a taxi driver, call the police on your mobile phone. Your driver will quickly change his tune. You can of course always ask reception, a restaurant etc... to call taxi on the number you give them. If you can't afford to haggle with cab drivers, you can always use public mass transit. The network is extensive and can take you almost anywhere in Prague 24 hours every day. Be careful with money exchanges. Exchange your money in banks or official tourist informations and rather avoid exchange offices. You may think the exchange rate is good, but study carefully - it is not! Generally the exchange offices outside the tourist areas are fair, although there are not too many of them there. In the tourist areas, however, most of the exchange offices try to cheat customers with various tricks. One of the them is offering favourable exchange rates, but with fine print below such as if you exchange more than 1000 EUR. Another trick is putting a huge board with "we sell" exchange rates to the shop window, which makes an impression of good rates, whereas the actual rate for buying CZK is much more unfavourable. Another trick is charging commission, which could be as high as 20%! When the customer finds this out at the counter and wants to cancel the transaction, the money-dealer refuses with an excuse "I have already printed the bill", implying it is too late. The police won't help you, typically referring you to the Czech National Bank, which supervises exchange offices, to file a complaint (which does not help you either). When comparing the exchange rates, follow two simple rules. First unless the board says "0% commission", the exchange office charges the commission. Second, while looking at the board, scan all the numbers for your currency and find the smallest one, this would be the exchange rate you would get. Credit cards are widely accepted at all supermarkets, hotels and also in most tourist places. As in most countries you can find cards for ATM withdrawals with low or 0% fee and often for payment with Visa or Mastercard exchange rate only (which is same as the rates of the best exchange offices); there is no need to use exchange offices anymore in the 21st century. Czech law is weak and orders exchange offices only to display the actual rates, which you might find somewhere in the office in small print. Therefore, if you decide to use an exchange office always ask for the actual rate you will pay before making the transaction and before letting any money out of your hands. If you find yourself in an emergency, dial 158 for police, 155 for ambulance or 150 for firefighters. You can also dial 112 for a general emergency call. If you need medication at weekends or evenings, you can go to Lékárna Palackého, (Tel +420 224 946 982) the 24-hour pharmacy on Palackého 5 in the new town. Beware of food stalls in Wencelas Square. Some of them will target tourists by providing them with extra products they did not ask for and not giving enough change. Prague is relatively safe and quiet in the evenings. Use common sense, but walking though neighborhoods late at night is not something you need to be terrified about. The bars are full, but violent crimes are comparatively uncommon. Buses and trains are frequent and quite inexpensive and can get you to even the smallest village. Practically every major European city can be reached by bus or train from Prague. Olomouc (284 km; 02h43 in car) — 284 km from Prague, but with a good train connection, former capital of Moravia, beautiful old city, famous medieval astronomical clock. Kutná Hora (84 km; 01h24 in car) — A once prosperous silver mining town in the 14th and 15th centuries with the fantastic Saint Barbara church, and the Sedlec Ossuary located in the suburbs, decorated with the remains of 40,000 human skeletons who were largely plague victims. Český Ráj (89 km; 01h09 in car) — Hike through forests and valleys filled with giant sandstone columns and cliffs in this park near Jičín. Orlík (85 km; 01h14 in car) — Orlík castle about 70 km from Prague. Near the Orlík dam and Zvíkov castle. This page was last edited on 21 April 2019, at 10:04.